Here’s a little secret: many, many people find conversation difficult. And the ones that think they find it easy, well – aren’t they the conversationalists who we so often find dull or irritating because they have no sense of self-censorship? Learning to constructively criticize your own social skills while recognizing the value and pleasure that can come from meaningful conversation is a powerful way of making a big impact on your life, and those people with whom you share it. 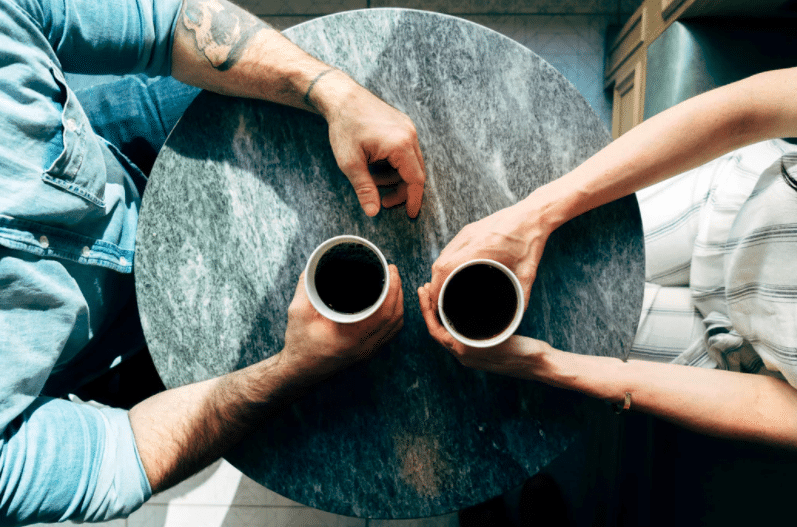 What’s beautiful about conversation is that it takes at least two people to have one (unless you’re really in a quandary about something and like to debate things with yourself!). This means that if you lack self-confidence and are hesitant to focus too much on your own conversation game, you can start by reflecting outwards and engaging in chat in more subtle ways. The key to great conversation, after all, is not speaking – but listening. Work on your listening and non-verbal communication skills first, and the art of dialogue will follow. Listening starts with giving your full attention. That means putting down phones and other devices and making eye contact with the person that you’re speaking with. Think about how babies react to eye contact: it is a fundamental part of conveying trust, attention, and togetherness. And believe it or not, you need to learn to listen with your eyes. All sorts of statistics abound as to what percentage of communication is visual versus verbal, but a pretty convincing case has been made that 55% of meaning is conveyed by facial expression, 38% from voice tone, and just 7% from the words used. If you’ve been glued to your phone the last few years, just think how much ‘meaning’ you’ve missed out on! Pay close attention to the nuances in someone’s way of speaking, and you will start to make new connections between things they say. Be patient, and don’t expect to reach an understanding as quickly as you might in a simplified online conversation: meaningful dialogue takes time! Listening also means letting go of your own ego for a moment. It can be easy to become distracted by your own thoughts, particularly when you’re forming an argument to what is being said or you’re excited about a great example you have to share. But while these words are forming in your mind, you’re only giving partial attention to the other person. Don’t be afraid of silences: listen carefully, then let them know that you’re thinking how best to phrase your response, rather than doing so while they’re still talking. When it comes to upping your own end of the dialogue, you can continue by working with what the other person has brought to the table. Make it clear that you’re listening, and improve your own understanding, by repeating back or rephrasing difficult or unclear ideas that the other person has spoken about, to ensure that you understand them properly. And don’t leap in with your own authoritative ideas – especially when it comes to giving advice – because that isn’t dialogue: it’s didacticism. It can be more constructive to ask questions and tease a subject towards resolution by working with each other’s ideas. That’s why you’re having a conversation with someone else to start with. Open-ended questions (beginning with How, What, or Why and requiring more than a Yes or No answer) are a great way of turning up unexpected information and ideas. Telling a story is another great way to engage your friend or colleague while making your point – and all without coming across superior. Words, as they say, are given to us to hide our true feelings; a story, on the other hand, while made of words, can convey more complex feelings and concepts through the use of themes and verbal images. We also just love to hear a good story, and have done since our ancestors first sat around the campfire. This step-by-step infographic from OnStride gathers these ideas and more into one place, so it’s easy to check in from time to time when you feel your conversation skills are lagging. It’s quite normal to be nervous of getting stuck in a conversation you can’t get out of – but just remember, the person on the other end is only human too.